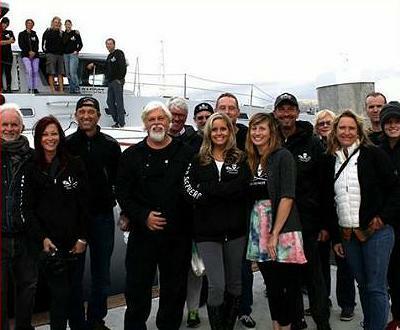 SEATTLE, Washington, October 31, 2013 (ENS) – Captain Paul Watson, founder of the Sea Shepherd Conservation Society, who has been living in exile at sea since he left Germany in July 2012, has just stepped ashore in the United States. An Interpol Red Notice is not an arrest warrant, but a request to governments to identify the whereabouts of an individual. The Japanese notice alleges that Watson is wanted for breaking into a vessel, damage to property, forcible obstruction of business and injury all allegations arising from the Sea Shepherd’s nine years of defending whales in the Southern Ocean from Japanese whalers. Watson arrived Wednesday, disembarking at San Pedro, California, according to a Sea Shepherd spokeswoman. Welcoming him was attorney and Sea Shepherd supporter Robert F. Kennedy Jr., along with other Sea Shepherd attorneys, supporters and volunteers. Watson was not arrested upon his arrival in the United States. He nevertheless presented himself to authorities in order to defend his case before the Ninth Circuit Court of Appeals sitting in Seattle, where he is facing accusations of piracy brought by the Institute of Cetacean Research, a government-funded agency which runs Japan’s “research” whaling program, Kyodo Senpaku Kaisha, Ltd, a Japanese corporation and two Japanese individuals. In a decision last December, a three-judge panel of the Ninth Circuit reversed a lower court ruling and granted the Japanese plaintiffs an injunction that orders the Sea Shepherd to stay at least 500 yards away from the whaling vessels to keep them from interfering with whaling activities in the Southern Ocean. The Ninth Circuit hearing in Seattle continues today. The judges are hearing allegations of contempt of court against Watson and the Sea Shepherd, according to a Sea Shepherd spokeswoman. In consideration of the preliminary injunction granted to the Institute for Cetacean Research, Watson has resigned his leadership role in the Sea Shepherd Conservation Society, and last season’s whale defense campaign was mounted by Sea Shepherd Australia. Watson was arrested in May 2012 in Frankfurt, Germany while he was heading to France for the Cannes Film Festival. Avoiding extradition to Costa Rica on decade-old charges related to an anti-shark finning campaign, Watson jumped bail in Germany in July 2012 and has been somewhere at sea until now. In March Germany dropped its arrest warrant for Watson, originally issued last year at the request of Costa Rica. Costa Rica did not meet a February 27 deadline set by the German court to explain why there was a warrant for his arrest. Despite the support of personalities such as Nicolas Hulot who directly addressed French President François Hollande, of many Sea Shepherd members, filmmakers, artists, intellectuals and more than 100,000 anonymous people who signed the manifesto in his favor, the French government has never made any approach or even had the slightest word of support for Captain Watson, said Essemlali.